OKLAHOMA CITY, Okla., May 14, 2018 – The 2018 U.S. Men's Junior Olympic National Championships at the Cox Business Convention Center in Oklahoma City, Okla., wrapped up on May 13. This is a summary of the team, all-around and individual event champions for both Junior Elite and Junior Olympic Divisions from over the four days. After four days of competition, here are the all-around medalists and event champions. 18 years old: 1. Evan Davis, Houston, Texas/Cypress Academy of Gymnastics, 139.200; 2. Michael Fletcher, Nashua, N.H./New England Academy of Gymnastics, 137.150; 3. Ian Gunther, Houston, Texas/Cypress Academy of Gymnastics, 137.000. 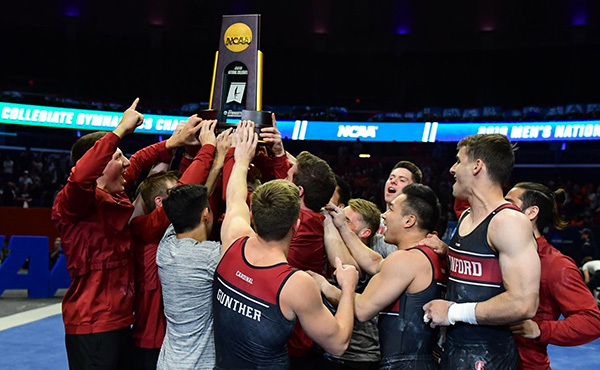 Events – Vitaliy Guimaraes, Arvada, Colo./5280 Gymnastics, floor exercise, 23.300; Ian Gunther, pommel horse, 23.150; Angel Leon, Tucson, Ariz./Gymnastics World Central, still rings, 24.200; Liam Doherty-Herwitz, Bedford, Mass./Brestyan's American Gymnastics, vault, 24.600; Ian Gunther, parallel bars, 24.100; Blake Wilson, Temecula, Calif./SCEGA Gymnastics, horizontal bar, 23.450. 17 years old: 1. Brandon Briones, Gilbert, Ariz./Aspire Kids Sports Center, 140.150; 2. Riley Loos, El Dorado Hills, Calif./Technique Gymnastics, 138.100; 3. Crew Bold, Delray Beach, Fla./TAG USA Gymnastics, 135.600. Events – Riley Loos, floor exercise, 138.100, and pommel horse, 22.400; Brandon Briones, still rings, 23.750; Riley Loos, vault, 23.850; Brandon Briones, parallel bars, 23.500, and horizontal bar, 23.550. 16 years old: 1. John Chou, Cypress, Texas/Cypress Academy of Gymnastics, 136.200; 2. Jeremy Bischoff, Canyon Country, Calif./Wallers Gym Jam Academy, 135.800; 3. Michael Jaroh, Northville, Mich./Michigan Elite Gymnastics Academy, 134.650. Events – Robbie Shamp, Marrero, La./All Star Gymnastics, floor exercise, 23.550; John Chou, pommel horse, 23.600; Michael Jaroh, still rings, 23.600; Zachary Martin, Elk Grove, Calif./Elevate Gymnastics Academy, vault, 24.350; Jeremy Bischoff, parallel bars, 23.450; Tyler Rockwood, Lancaster, Ohio/Hocking Valley Gymnastics Center, horizontal bar, 22.700. 15 years old: 1. Isaiah Drake, Los Angeles, Calif./Gymnastics Olympica USA, 134.750; 2. Brandon Nguyen, Elk Grove, Calif./Elevate Gymnastics Academy, 134.350; 3. Taylor Burkhart, Morrison, Colo./5280 Gymnastics,, 134.300. Events – Taylor Burkhart, floor exercise, 19.950; Rithik Puri, Chicago, Ill./Lakeshore Academy of Art Gymnastics,, pommel horse, 21.650; Fuzzy Benas, Richmond, Texas/EnRich Gymnastics and Dance Academy, 23.350; Taylor Burkhart, vault, 24.750; Isaiah Drake, parallel bars, 23.050; Brandon Nguyen, horizontal bar, 23.700. Level 9, 14 years old: Ian Lasic-Ellis, Dover, Mass./Massachusetts Elite Gymnastics Academy, 136.050, all-around; Landen Blixt, Fowlerville, Mich./Infinity Gymnastics Academy, 23.750, floor exercise; Vishal Mandava, Cypress, Texas/Cypress Academy of Gymnastics, 22.750, pommel horse; Ian Lasic-Ellis, 23.350, still rings; Luke McFarland, East Hartland, Conn./Daggett Gymnastics, 23.050, vault; Ian Lasic-Ellis, 22.700, parallel bars, and 22.600, horizontal bar. Level 9, 13 years old: Joshua Karnes, Erie, Pa./Lakettes Gymnastic Academy, 137.850, all-around, and 23.700, floor exercise; Caden Clinton, Cypress, Texas/Cypress Academy of Gymnastics, 23.100, pommel horse, and 24.000, still rings; Joshua Karnes, 22.900, vault; Caden Clinton, 23.000, parallel bars; Joshua Karnes, 22.550, horizontal bar. Level 8, 12 years old: Vahe Petrosyan, Van Nuys, Calif./Gymnastics Olympica USA, 135.250, all-around; Ian Sandoval, Frisco, Texas/WOGA Gymnastics, 23.550, floor exercise, and 23,659, pommel horse; Vahe Petrosyan, 22.600, still rings; Kaleb Palacio, Houston, Texas/Above the Bar Gymnastics Academy, 22.950, vault; Maxwell Odden, Scottsdale, Ariz./North Valley Gymnastics, 22.850, parallel bars; Evan Wenstad, Santa Clarita, Calif./Wallers GymJam Academy, 22.650, horizontal bar. Level 8, 11 years old: Jaden Bottarini, Valley Village, Calif./Gymnastics Olympica USA, 132.450, all-around, and 22.400, floor exercise; David Alii, Knoxville, Tenn./Premier Athletics Knoxville North, 23.050, pommel horse, and 22.550, still rings; Oleksandr Shybitov, Chicago, Ill./Lakeshore Academy of Art Gymnastics, 22.850, vault; Alex Deubler, Frisco, Texas/WOGA Gymnastics, 22.250, parallel bars; Sasha Bogonosiuk, Schaumburg, Ill./Gymkhana Gymnastics Club and Dance Studio, 22.100, horizontal bar. 18 years old: 1. Eric Lung, 155.950; 2. Luke Smigliani, Hanover, Mass./Ellis School of Gymnastics, 155.900; 3. Miles Miller, Hartsdale, N.Y./World Cup Gymnastics, 154.600. Events – Daniel Lasenbby, Las Vegas, Nev./Vitaly Scherbo School of Gymnastics, Level 10 Daniel Lasenbby, still rings, 27.850; Zach Ziolkowski, South Bend, Ind./Gymnastics Michiana, vault, 29.900; Nick Smiley, South Elgin, Ill./St. Charles Gymnastics Academy, parallel bars, 25.900; Ben Eyles, Ames, Iowa/Triad Gymnastics, horizontal bar, 26.150. 17 years old: 1. Jakob Murray, Manchester, N.H./Granite State Gymnastic & Fitness, 155.700; 2. Kyle Shuttle, El Granada, Calif./Accel Gymnastics, 153.650; 3. William Gomez, 152.050. 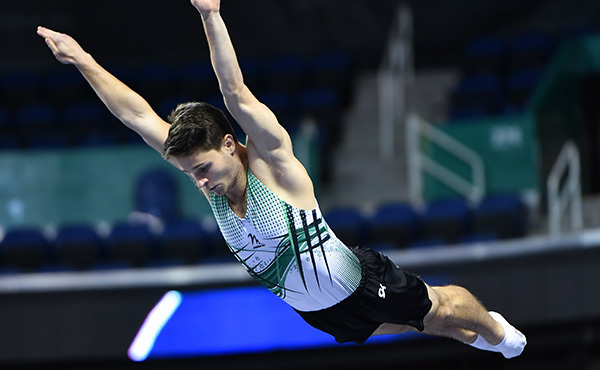 Events – William Gomez, Miramar, Fla./Park Avenue Gymnastics, floor exercise, 28.900; Will Lavanakul, Dublin, Calif./West Coast Olympic Gymnastics Academy, pommel horse, 27.300; Reuven Roberson, Valencia, Calif./Wallers GymJam Academy, still rings, 27.250; Kyle Shuttle, vault, 29.550; Yuchen Lee, Orange, Calif./South Coast Gymnastics, parallel bars, 26.750; Jakob Murray, horizontal bar, 25.500. 16 years old: 1. James Friedman, Salem, Ore./OMEGA Gymnastics, 154.700; 2. Max Enis, Sterling, Mass./Sterling Academy of Gymnastics, 154.600; 3. Matthew Schuchman, Hauppauge, N.Y./Hotshots Gymnastics Inc. 152.850. Events – Matthew Schuchman, floor exercise, 27.000; Cooper Giles, Lake Zurich, Ill./Premier Gymnastics Academy, pommel horse, 26.800; James Friedman, still rings, 27.300; Maxim Ryzhuk, Las Vegas, Nev./Vitaly Scherbo School of Gymnastics, vault, 28.600; Max Enis, parallel bars, 26.300; Matthew Schuchman, horizontal bar, 25.750. 15 years old: 1. Dante Hays, Monroe, Wash./Metropolitan Gymnastics, 152.100; 2. Matthew Romalia, Highlands Ranch, Colo./5280 Gymnastics, 151.050; 3. Mark Berlaga, Palo Alto, Calif./Stanford Boys Gymnastics, 149.150. 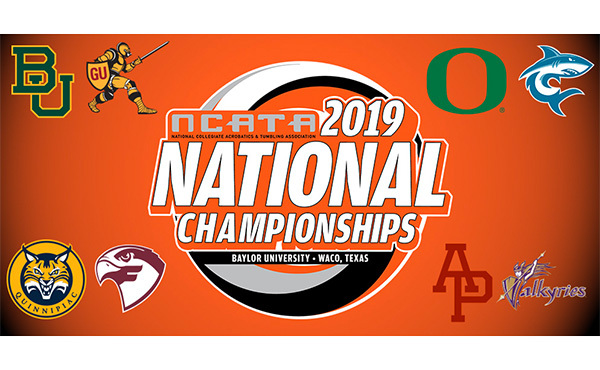 Events – Taso Callanan, Columbus, Ohio/International Gymnastics Academy, floor exercise, 27.350; Matthew Krall, San Jose, Calif./California Sports Center, pommel horse, 25.600; Kyler Hartley, Lakewood, Colo./5280 Gymnastics, and Christopher Hiser, Longmeadow, Mass./Daggett Gymnastics, 25.800; Caden Spencer, Huntington, W. Va./Bozhis Gym Nest, vault, 27.850; Dante Hays, parallel bars, 26.650; Jack Bono, Grove City, Ohio/International Gymnastics Academy,, horizontal bar, 25.400. Level 9, 14 years old: Justin Ciccone, Rochester, N.Y./Bright Raven Gymnastics Inc., 151.100, all-around, and 26.650, floor exercise; Marcus Kushner, Wellesley, Mass./West Coast Olympic Gymnastics Academy, 25.050, pommel horse; Adriel Perales-Valencia, Tucson, Ariz./Gymnastics World Central, 26.100, still rings; Justin Ciccone, 26.600, vault; Adriel Perales-Valencia, 26.000, parallel bars; Justin Ciccone, 25.250, horizontal bar. 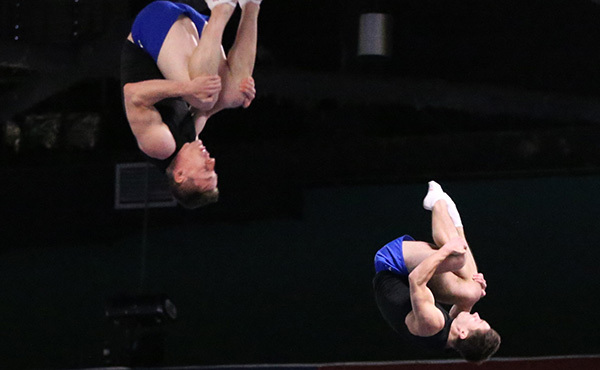 Level 9, 13 years old: Robert Noll Jr., Shelby Township, Mich./Olympia Gymnastics Academy, 147.700, all-around; Jake Harmon, Hooksett, N.H./Granite State Gymnastic & Fitness, 26.550, floor exercise; Brandon Dang, San Jose, Calif./West Coast Olympic Gymnastics Academy, 23.250, pommel horse; Luke Esparo, North Haven, Conn./New Era Gymnastics, 26.150, still rings; Payton Kasper, Minnetrista, Minn./Mini-Hops Gymnastics, 26.700, vault; Kellan Stodden, Littleton, Colo./5280 Gymnastics, 25.700, parallel bars; Robert Noll, 24.150, horizontal bar. Level 8, 12 years old: Conor Heary, Littleton, Colo./5280 Gymnastics, and Kendell Powell, Milwaukee, Wis./Salto Gymnastics Center, 148.600, all-around; Kendell Powell, 26.150, floor exercise; Christian Goldner-Luedtke, Milwaukee, Wis./Swiss Turners Gymnastics Academy, 25.800, pommel horse; Niko Greenly, Reno, Nev./High Sierra Gymnastics, 24.400, still rings; Kendell Powell, 25.350, vault; Conor Heary, 25.800, parallel bars; Max Finn, Georgetown, Mass./Yellow Jacket Gymnastics Club, 25.250, horizontal bar. 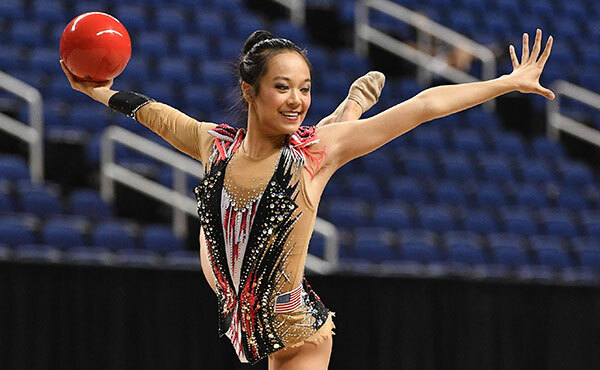 Fourteen Level 8 and Level 9 gymnasts from the Junior Elite Division were named to the Level 8-9 Junior National Team at the conclusion of the Junior Olympic Championships. Level 8. Region 3 (Arkansas, Kansas, Louisiana, Missouri, Oklahoma, Texas) won the team title with a 238.100 total. Second place went to Region 1 (Arizona, Hawaii, California, Nevada) at 237.300. Region 5 (Illinois, Indiana, Kentucky, Michigan, Ohio) rounded out the top three at 233.500. Level 9. Region 7 (Delaware, Maryland, New Jersey, New York, Pennsylvania, Virginia, West Virginia) tallied a 234.000 team total for the top spot for Level 9. Region 3 scored 233.200 to garner second, followed by Region 5 in third at 233.050. Level 10. Region 1 (Arizona, Hawaii, California, Nevada) easily earned the title with a 254.150 total. Region 3 (Arkansas, Kansas, Louisiana, Missouri, Oklahoma, Texas) took second at 251.600, followed by Region 7 (Delaware, Maryland, New Jersey, New York, Pennsylvania, Virginia, West Virginia) at 246.300. Level 8. Region 5 (Illinois, Indiana, Kentucky, Michigan, Ohio) won the team title with a 365.600 total. Second place went to Region 8 (Alabama, Florida, Georgia, Mississippi, North Carolina, South Carolina, Tennessee) at 365.500. Region 4 (Iowa, Minnesota, Nebraska, North Dakota, South Dakota, Wisconsin) rounded out the top three at 364.350. Level 9. Region 1 (Arizona, Hawaii, California, Nevada) tallied a 374.700 team total for the top spot for Junior Olympic Level 9. Region 5 scored 367.150 to garner second, followed by Region 8 in third at 365.250. Level 10. Region 1 (Arizona, Hawaii, California, Nevada) won the Regional Junior Olympic Team title at 395.850 for Level 10. Region 7 (Delaware, Maryland, New Jersey, New York, Pennsylvania, Virginia, West Virginia) was second at 393.900, and Region 6 (Connecticut, Maine, Massachusetts, New Hampshire, Rhode Island, Vermont) was third with 390.800. Level 8. Gymnastics Olympica, based in Van Nuys, Calif., clinched the Level 8 Club Team title with a 231.600. At 230.150, Cypress (Texas) Academy of Gymnastics claimed the runner-up spot. WOGA Frisco (Texas) took third at 228.800. Level 9. West Coast Olympic Gymnastics Academy in Pleasanton, Calif., earned 224.400 and team honors. Gymnastics Olympica grabbed second with a 221.150. Located in Oswego, Ill., Premier West landed in third with a 220.850. Level 10. Cypress Gymnastics Academy tallied an impressive 249.500 to take the Level 10 Club Team title. 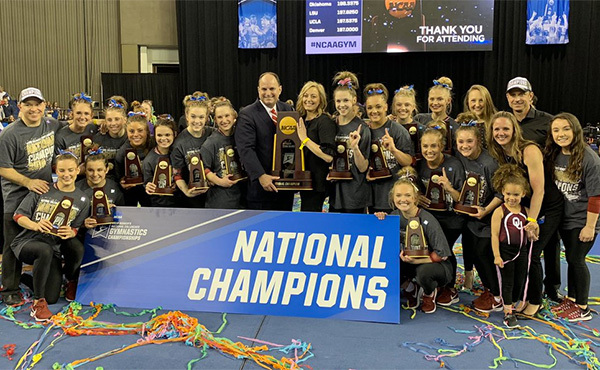 5280 Gymnastics North, based in Denver, Colo., was second (251.60), and Wallers’ GymJam Academy in Santa Clarita, Calif., rounded out the top three (246.300). For Level 10 athletes competing in the Junior Elite Division, the Junior Olympic National Championships was a qualifier for the 2018 U.S. Gymnastics Championships (Aug. 16-18 in Boston, Mass. ), where the Level 10 Junior National Team will be determined. Fourteen Level 8 and Level 9 gymnasts from the Junior Elite Division will be named to the Level 8/9 Junior National Team at the conclusion of the Junior Olympic championships. The meet coordinator was Ben Fox and Bart Conner Gymnastics Academy was the host club.